From the epic film, Once Were Warriors, to his role as Jango Fett in Star Wars: Attack of the Clones, Temuera Morrison has been acting power house for over 30 years. And he’s not slowing down. He’s starring in writer-director Luke Sparke’s alien invasion film, Occupation, about a group of townspeople who band together to strike back at the alien Invaders. It’s a fun movie that doesn’t hold back and as usual Morrison is great. He’s also about to start in the upcoming DC film, Aquaman. In the interview, he talks about Occupation, being an actor and how he got his role in Aquaman. You guys didn’t hold back on this movie. There’s no nonsense going on, you know? The action starts pretty quickly and we don’t have to wait for the aliens to show up. Temuera Morrison: Yep, I’m not quite sure if I liked that like you, I thought it was too soon. But yeah you’re right. The way that Luke kind of shaped it, I saw it the other day at the screening so I was kind of surprised that we got to see the alien straight away, like as you say, no nonsense. This was a low budget film but it doesn’t look that way at all. The production value is really great. Temuera Morrison: Yes, they are very good. I did a similar movie before Occupation, that was called The Osiris Child, and again there too, these Aussies are quite clever in the way they use their limited resources and in making it quite a powerful thing. How do you decide what to work on? This was a low budget movie with aliens. I mean, honestly, this could have been a real mess, you know? And look, the timing was good. The timing was good for me. I was actually thinking I had the role in Aquaman, the lighthouse keeper. I knew it was in the same place as well, it was on the Gold Coast of Australia, so this was just came around at the right time. It was wonderful to get to work before Aquaman, as well, so I could tune myself up in terms of just working around a camera. It’s easy to get stale in our business if you’re not working around the environment, if you haven’t got a camera around you, if you’re not acting, if you’re not trying to have the emotions. So the timing was great for me. The place, the Gold Coast, the people were nice, so I had a great time. Just kind of going over your resume and seeing you in lots of parts over the years, it seems like you’re never really not working. Temuera Morrison: Oh, no. There are a few pauses in between, it just looks like I’m working all the time. I’ve had a great year though, this year. It’s a great year, this year. We finished Aquaman and Jason liked me so much, he wrote me into Frontier, a Netflix show that we did. I started the year off being in England, at a place called Newcastle, Cornwall. We went to Newfoundland in Canada. So I had a great year, great start. But I really got to like the Occupation people. It was pretty, there weren’t any frilly bits you know, you just had to pitch in and work hard. Twenty of us all in the one trailer, things like that. And we had the guitars out, we had a nice camaraderie. Some of the actors played their music, played their guitars so we had a lot of fun at the same time. That’s what it’s about too, if you enjoyed the project. And how it’s going turn out sometimes it’s out of our hands. I thought the ensemble was good, we had a nice variety there of people. You guys already have the sequel in the works. Temuera Morrison: For something that started off as a holiday on the Gold Coast and now we’ve got a sequel. It was about this time last year, winter. It gets cold up here in New Zealand so again, the location was a big draw. Let’s just get out of the cold for a while, do some acting, shoot some aliens. Get a bit warmer. So that’s what I did and now I’ve got a sequel, so it looks like we’re shooting more aliens or, I don’t know, maybe I better read the script. It’s why I do it, I enjoy traveling to Australia, going to meet the wardrobe, put some clothes on, what are we filming today? Okay, Luke, where’s the camera going to be? Where’s my close-up? I enjoy all of that. You know, it doesn’t have to be a Hollywood production to do that. What I’m really going to get into, is this is my work. I was speaking about it the other day, I said, “Gee, man- if I wasn’t acting, what else could I do?” There wasn’t a whole lot of things that I would be happy doing, if you know what I mean. So, I enjoy what I do. And then, I got to work on Aquaman right after Occupation. I was also tuning up, if you know what I mean? Just tuning up the engine, tuning up the emotions. And in Occupation, Luke had me doing everything. Bashing aliens with an ax, I was kind of drawing on the warrior spirit again. Yeah, you’re a genuine action star in this movie. Temuera Morrison: That’s what I’m trying to do. Get back in that action scene, like Liam Neeson. For Aquaman, I read that Jason Momoa, he was instrumental in getting you that part. 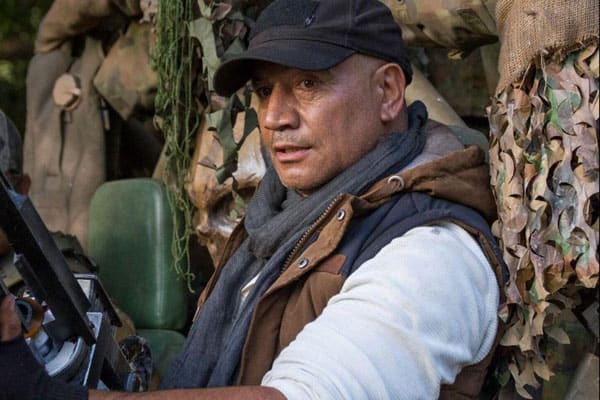 Temuera Morrison: I didn’t realize it at the time but I found out later that Jason was a big fan of mine through the movie, Once Were Warriors. In terms of his own cultural identity and stuff like that, so it really blew him away that movie. So I think he might’ve put his hand up to say, “Hey, I want this guy.” So, he was a big fan of mine. I found all of this out later. I did go through the proper way though. I met the casting people in Los Angeles through my agent and the process started. But, having Jason there as backup was immense. Plus, he liked me so much, as I said, we got to work together again on Frontier. He’s a great guy. He looks after me. You’ve been an actor for such a long time, how have you managed to keep working all of this time when others who started around the same time you did have just kind of faded away? Temuera Morrison: I guess I’m just blessed, I don’t know the answer for that one. I live over by the ocean in modest little beach place and I’m looking at the ocean and the phone is not ringing. So, there are those times when you’re wondering what to do. But, fortunately something comes along, like in Occupation and you get noticed again. Somebody thinks of you so, I’ve just been blessed, I guess, that I’ve still been able to work. And then I try and just keep busy in between. At the end of the day, I want to make some our own stories, our Maori stories. Something in our own languages as well and try to promote that as well. You know, we have our own stories to tell. But I’m still working as an actor at the moment and I’m just blessed to be able to keep working. Occupation is now available to rent and stream everywhere, including Amazon.